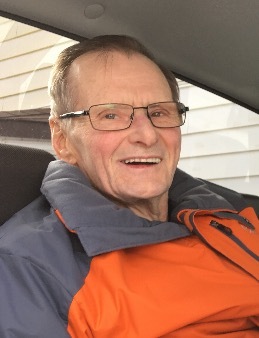 THIEL – Robert (Bob) Joseph, age 78 years, passed away on Sunday August 5, 2018 at the Evergreen Health Center in Leoville, SK. Robert was born in the family log farmhouse in Timberland on July 2, 1940. He was the 2nd of 8 children of Victor and Josephine Thiel. He attended school in Timberland and Leoville. He helped out on the family farm prior to having jobs in Thompson, MB, Swan Hills, AB, Pine Point, NWT, Melfort, SK, and Fort St. John, BC. In 1969 he began a long career as a millwright at the pulp and paper mill in Prince Albert, SK. He continued on there until his retirement in 2004. Bob married Pauline on November 28, 1970. They continued to reside in Prince Albert, SK and raise three loving children, Nadine, Cindy, and Kevin. He taught his children many things, including patience, love, and the value of hard work. Bob was also blessed with three adoring grandchildren, Stephen, Anna, and Ashton. Throughout his life and in addition to working at his other jobs, Bob continued to come home to what he truly loved ... his farm. He was both a grain and cattle farmer. He farmed his own land until 2007 and then continued to help out his brother, Ed and son, Kevin. Although he did not do much active work on the farm after a stroke in 2009, he still enjoyed spending much of his time there helping where he could. He was always known as the fixer and the one to keep all the equipment in tip top shape. When not working or farming, he enjoyed hunting, fishing, and spending time with his family. Due to health issues, Bob spent the last couple years of his life in the Evergreen Health Center, where he passed peacefully, surrounded by family. Bob will always be remembered for his quiet, humble nature, witty humor, and hard work ethic. Bob leaves to cherish his memory: loving wife of 47 years, Pauline, children and grandchildren: Nadine (Tim) Bryant and their daughters, Anna and Ashton; Cindy Thiel (Treana Tuchscherer) and son, Stephen Peesker; Kevin Thiel, siblings: Raymond (Sandra)Thiel, Sylvia Boyer, Doris (Ernie) Denis, Richard (Susan) Thiel, Ed (Suzanne Poulin) Thiel, Leslie (Suzanne) Thiel, mother-in-law, Eva Crossland, sisters-in-law: Sylvia Orieux and Ann O’Shea and also numerous nieces, nephews, friends, and other relatives. Bob was predeceased by: parents, Victor and Josephine Thiel, brother, Ron Thiel, infant grandson, Samuel Thiel-Tuchscherer, father-in-law, Albert Crossland, brothers-in-law, Gerry Orieux and Dennis Boyer and nephew, Dennis “Dee-Dee” Boyer, Jr. Funeral Mass was held Friday, August 10, 2018 at 10:30 am from St. Therese Roman Catholic Church, Leoville, SK with Father Peter Nnanga, MSP as celebrant. The Cross Bearers were Anna & Ashton Bryant, the Eulogy was delivered by Adele Craswell and music ministry was provided by Sue Poulin, Deena Fisher, Shanda Laventure, Gilles Francouer, Ashton Bryant and the Thiel Brothers. Honorary Pallbearers were considered “All those who shared in Bob’s life”, Kevin Thiel, Stephen Peesker, Ray Thiel, Ed Thiel, Richard Thiel and Les Thiel served as casket bearers. Following a private family interment, the family invited all present for a time of lunch and fellowship in the Community Hall. In lieu of flowers, memorial donations can be made to the Evergreen Health Center, Leoville, SK. Family and friends wishing to send online condolences are welcome to visit www.beaulacfuneralhome.com. Arrangements have been entrusted to the care of Beau “Lac” Funeral Home, Mark Muir, Funeral Director, Spiritwood, SK 306-883-3500.